My family is big into patties of all kinds. Salmon sweet potato cakes, bean burgers, or beef burgers- you name it, we like it. Patties freeze well, can have any flavor combination, use all kind of different protein sources, veggies are easily added, and they are the perfect size to slip into a lunch box. For my big kids a full-sized burger is just right, but for my little girl a slider is more her size. Yep, I know I could simply cut a patty in half, but there is something so fun about having her own perfect little burger that makes her gobble it right up. And that makes this mom happy! I saw this yummy recipe with all my little’s favorite things from Multiply Delicious on Smithfield.com. I changed it up a bit and added freezer instructions so I can make them ahead and have them on hand whenever we need them. 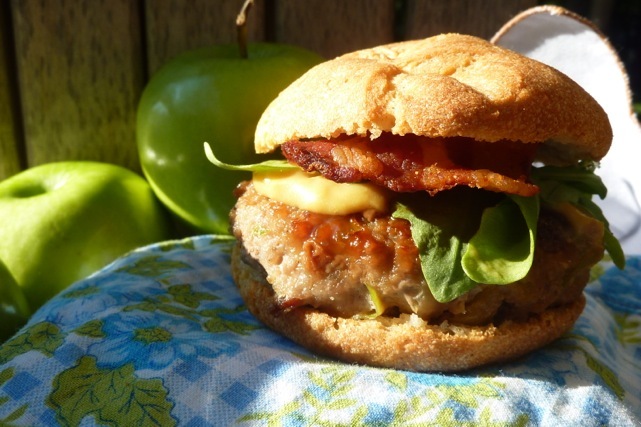 Chicken Apple Bacon Sliders have crisp cooked bacon and sweet grated apple mixed into the ground chicken. The resulting patty is juicy with a bit of sweetness and a bit of smokiness. Yum! Make them full sized if you choose to. They are also really delicious on the grill. Mix up a batch and you will see what I mean! In a large bowl, stir shredded apple with celery, poultry seasoning, pepper, and salt until blended. Mix in honey, chicken, and crumbled cooked bacon. Combine until well mixed, but do not overmix. Shape chicken mixture into ½-inch-thick sliders, using ⅛th pound of meat per slider. Freezing Directions: To freeze, place sliders on a baking sheet lined with plastic wrap. Place in the coldest part of the freezer. When frozen through, divide and place into indicated number of freezer bags separated by waxed paper. To serve: Prepare outdoor grill on medium, or heat a lightly oiled pan at medium-high heat on stove. Cook sliders 4 minutes on each side or until chicken is cooked through.